Blog Foodie Trucks on the Track! Foodie Trucks on the Track! All of our “foodie truck” props “rolled” onto the Richard Petty Driving Experience for a “race infield” event experience with Puff n’ Stuff Catering! Some of our facades featured brand new custom signs to reflect the type of food being served at each station. With clear distinguished food truck names, it became easy for guests to listen to their cravings & decide which truck they wanted to visit! This certainly was a Fast & Fun Food Truck event! 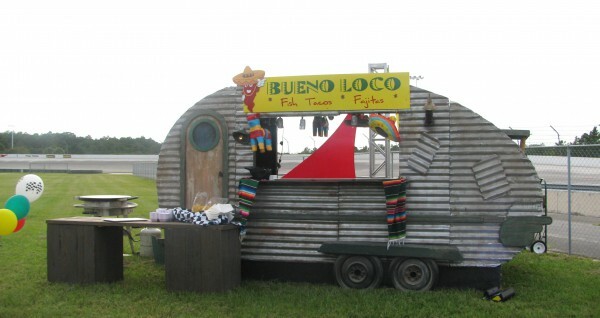 Our “Catfish Charlie’s” trailer bar was transformed into “Bueno Loco-Fish Tacos & Fajitas” food station, complete with authentic serapes, sombreros, and piñatas to become a “fiesta”. The food that was served out of this “food truck”? You guessed it…Mahi Mahi Fish Tacos and create your own Chicken Fajitas! 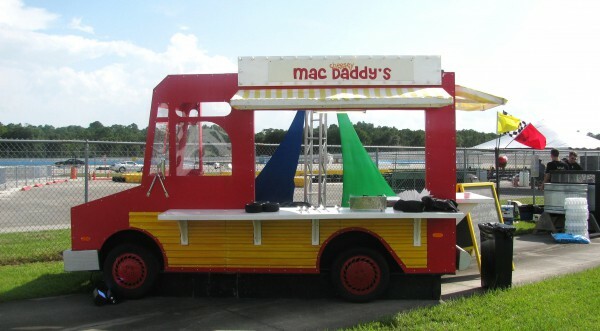 The “Sweet Street” prop was converted into “Cheesy Mac Daddy’s” foodie station with a simple change of signage! The bright yellow A-frame chalkboard displayed the evening’s Mac & Cheese option-a Vegetarian Macaroni & Cheese Bar, complete with broccoli, fried onions, mushrooms, jalapenos and tomato salsa as additional toppings! 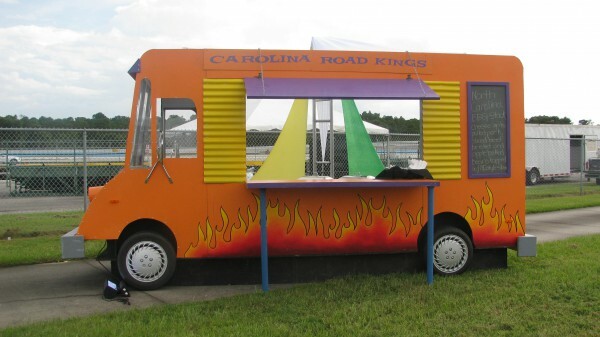 Our “Chili Road Kings” prop transformed into “Carolina Road Kings”-serving classic North Carolina BBQ. The mounted chalkboard created a perfect menu display listing all the delicious Southern comfort foods served-cheesy grits, pulled pork, sliced beef brisket, apple baked beans, and North Carolina style coleslaw. YUM! 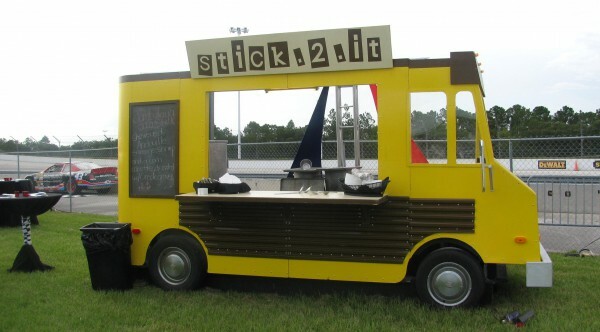 The yellow & brown “Stick 2 It” food station featured Jambalaya On a Stick, with skewered Andouille sausage, shrimp, and a small “corn on the cob”. It was the perfect grab and go food item! 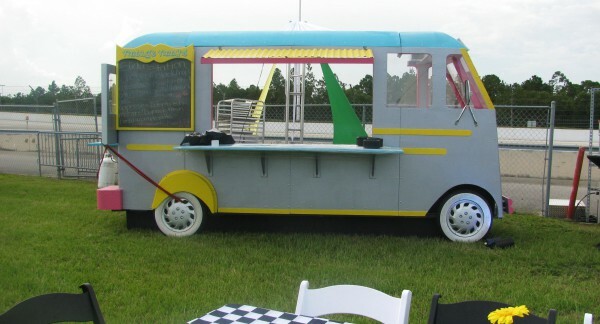 Our Vintage Vinny’s Food Truck made its debut outside as a slider station. Attendees were able to pick between an Angus cheeseburger with smoked cheddar and grilled onion aioli and a Caprese slider with fresh mozzarella, pesto, basil, and a roma tomato. Each was served with delicious sweet potato fries. With double food displays, Vintage Vinny was able to have double the space for attendees to grab from! Our team had a great time creating quirky names for the food stations to reflect the delicious food from Puff n’ Stuff Catering! The unique venue & trendy theme topped off this incredible evening!